Now is the time to stop and think. Do a little research. Have a look around and see what type of chickens you would like. Ask many Questions. Do you want little chickens that you can raise? 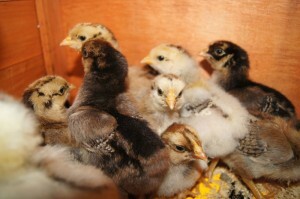 Or would you like to buy young hens (pullets) just as they are about to start laying. Or older birds that are already laying regular. When I was younger, we raised chickens for eggs and for the table. Back then we needed to be able to be a little self sufficient. Most families now, prefer to just have some nice hens to have fresh eggs. If this is what you would like then you need to ensure that you do not purchase chickens that are designed for the table, as they do not make good layers. Meat chickens tend to eat you out of house and home and do not give the eggs in return. They will get fat and lazy. The ideal starting point would be your local show. Most local shows have a poultry section. Many of the breeders of the chickens will be close by to answer any questions you may have. You only need to ask! We have recently gained a renewed interest in our chickens, wanting to change from just egg producing, to the pleasure of raising our own chickens. Instead of choosing to mix the breeds for egg production, we have chosen to look at some pure breeds. Backyard Chicken was born from this decision. We wanted to look at size, colour, temperament and most of all layers. We attended our local show at Murwillumbah in Northern New South Wales. Now the fun begins. Most breeders are only too happy to help you with information. After looking at all the breeds on display, and listening to the many professional breeders, we decided to stick with a medium size, good laying breed. Rare breed as they may be, but very good natured, one could call them even a bit timid/shy. Barnevelders are in the category of rare breed and soft feathered.